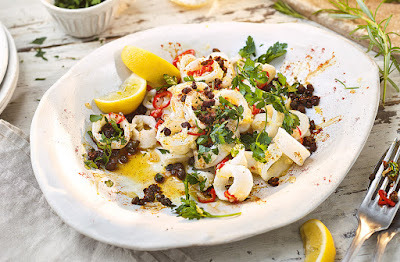 This sticky garlic squid is an ideal easy sharing dish, ready in just 15 minutes. Squid is stir-fried in garlic and chilli until caramelised, then topped with crispy capers for a simple finishing touch. Serve with plenty of fresh herbs and lemon to squeeze over. Heat the 2 tsp oil in a nonstick frying pan over a medium-high heat and fry the capers for 30 secs until crispy. Remove with a slotted spoon and transfer to a mixing bowl with ½ tsp paprika. Toss together. Wipe out the pan and heat 2 tbsp oil over a high heat. Add half the garlic and chilli and stir-fry for 10 secs. Add half the squid in an even layer. Cook for 1 min until it starts to turn golden, then stir-fry for 3-4 mins until cooked. Season with salt, half the lemon juice and half the parsley. Mix and transfer to a warm serving dish. Repeat with the remaining squid. Top with the capers and remaining paprika and parsley. Serve with lemon wedges.